Spring Velocity – A Racing Enthusiasts Dream Weekend! The unofficial kick-off to the summer season begins at Sunset Speedway for the annual Spring Velocity super weekend on May 19th and 20th. Spring Velocity includes two days of action packed racing, featuring the APC Pro Late Model tour, the ultra-cool OSCAAR Hot Rods presented by Fox’s Bakery, the ground-pounding OSCAAR Modifieds, and the newly formed Great Lakes Concrete Series, featuring Late Models, Super Stocks and Mini Stocks! Also at Spring Velocity 2018 – Lucas Oil Can-Am TQ Midgets, Outlaw Midgets, Legend Cars & Bone Stocks! 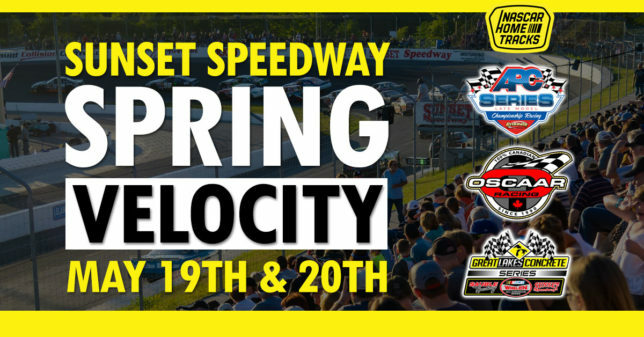 SPRING VELOCITY – DAY 1 – Presented By: Fox’s Bakery – APC Pro Late Model 100 Lap + Lucas Oil Can-Am TQ Midgets + Outlaw Midgets + OSCAAR Hot Rods + OSCAAR Modifieds Qualifying. SPRING VELOCITY – DAY 2 – Great Lakes Concrete NASCAR Whelen Series 75 Lap Late Models + 35 Lap Super Stocks + 30 Mini Stocks + 20 Lap Bone Stock + Legends + OSCAAR Modifieds + OSCAAR Hot Rods + Pro Sprints. (Rain Date: Mon May 21st – if necessary). Spring Velocity 2 Day Passes are available!